A custom built home with a beautiful view of the lake and golf course. A formal living and dining room, double crown, buffet niche, custom window treatments, and separate foyer will "wow" all that enter. This home features a large kitchen with granite, breakfast bar, separate wet bar, planning desk, and has a breakfast nook with aquarium glass overlooking the outside lanai. The family room has a fireplace for those cool evenings. Each bedroom has it's own bathroom, and one has access to the pool. The spacious master bedroom has a dressing area with huge walk in closet, and an ensuite luxury bath. An outdoor kitchen with an electric grill is perfect for those sunny days and barbeques. This home has a full 3 stall sideload garage with space for a work area. 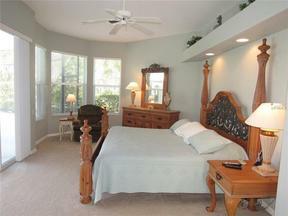 2 stoplights to the Nokomis beaches, restaurants, shopping, and parks. Calusa Lakes is a semi private golf course with optional membership for 63 holes. Residents enjoy the Har Tru tennis courts and many activities within the neighborhood. Low homeowners association fee of $219 quarterly includes the water for irrigation, the night guard at the entrance, the ambiance of full waterfalls to greet guests, and the maintenance of the roads and common grounds. Enjoy living in your own private paradise!